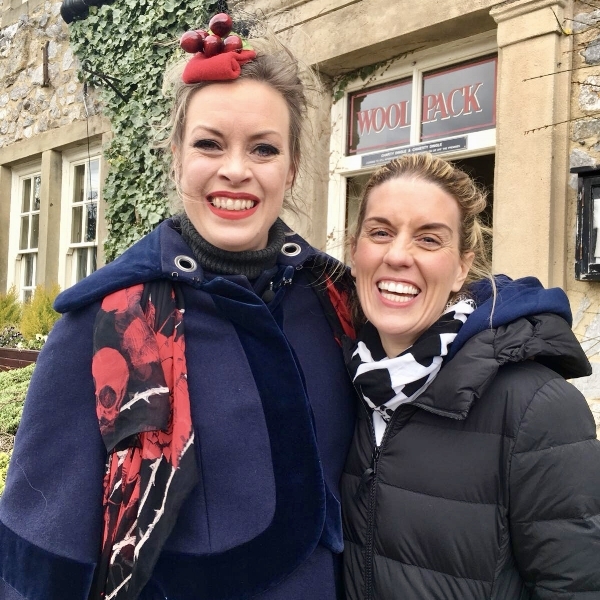 On Friday, our Queen on Soaps, Sharon Marshall and I packed our thermals, as we headed up to The Dales to film an exclusive Behind the Scenes piece for 'This Morning' at 'Emmerdale'. It was a cold windy day but we received a warm welcome from all the cast and crew who were on hand to show us around and keep us warm with regular cups of northern brew. It was my first time on the actual village set and so in between takes, I could not resist the urge to have a nosey around. Credit to the production designers, they have done a fantastic job making it feel like you are in an authentic Yorkshire village. The attention to detail is fantastic. It was particularly fun to see what lies behind each front door - with make up, production offices and costume all cunningly disguised. Sadly I cannot tell you anything divulge anything what we were filming as the storylines are embargoed....(my lips are sealed, I promise!) But suffice to say, there is plenty of drama, intrigue and humour.